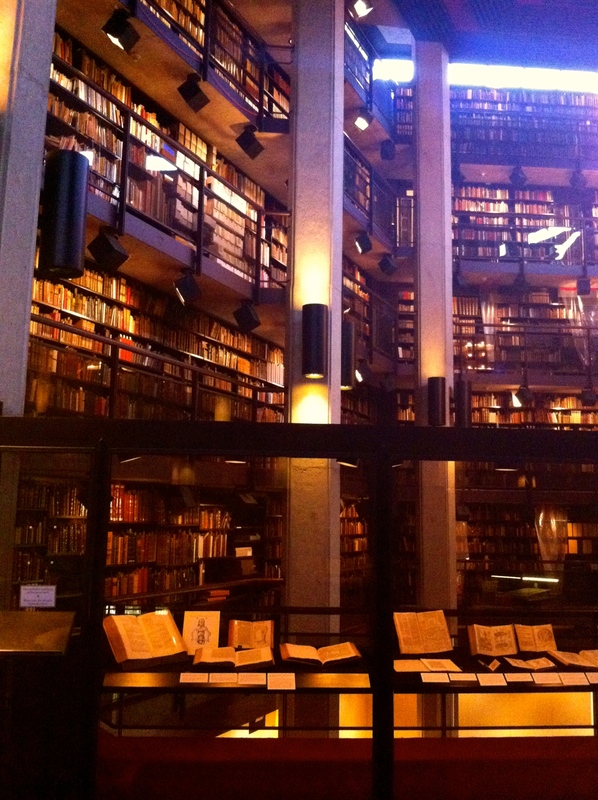 What book blog is complete without a post about libraries? Having just visited a beautiful library myself, I’d like to open this post up to all of my loyal fans and ask that you write in with a library (or libraries) that you have personally visited. Please tell us which library you were at, a link to it, and a brief description of what made it especially awesome! With roughly 700,000 holdings, this library is the largest of its kind in Canada, and ranks third (I think) in North America. Their claims to fame are a Shakespeare First Folio, one of the largest Alice in Wonderland collections in the world, and a Babylonian cuneiform tablet, among many other gems and rarities. Their website is http://fisher.library.utoronto.ca but it’s not tremendously exciting. If you want pictures to feast your eyes on, I suggest doing a simple Google search for Fisher Library images, and sit back and enjoy! If you’ve ever viewed a digitized book or manuscript, you know how very two-dimensional it is, and that seeing an image on a computer screen is nothing like holding the object in your own hands. Of course, a 2D version is far better than nothing, but it is limited in the information it can convey to you. You do not need specific software to view the images that Dr. Endres and his team have made available, just an up-to-date browser. Imagine having texts in a language unknown to you, translated and viewable in your language, right on the page that still contains accurate stains, tears and cockling as found on the original. 3D can also digitally flatten pages that were so warped that reading the original artifact difficult. Each 3D page is built onto a digital wire frame that exactly matches the original page in every warp and wrinkle, and a full range of photographs is taken in every colour in the spectrum to create the truest possible representation. In short, while 3D acknowledges that a digital image in not the same as the real thing, its aim is to make a representation of the original that may be even better: the pages can be rotated 360* in any angle; infrared pictures allow us to see any corrections that were made to the manuscript that the naked eye can’t pick up; digital flattening of warped pages; and digital translations. 3D digitization is extremely time-consuming and expensive, which is why it is still very rare. But the more people who know about this, the better, so spread the word! Red Rot: What is it? Have you ever noticed that old books can leave their mark on you, in more ways than one? Vegetable-tanned leathers can start to break down as a result of exposure to less-than-optimal environmental conditions like high relative humidity, airborne pollutants, or high temperature. The leather becomes powdery and reddish-brown in colour. The damage is permanent and irreversible, but further deterioration may be prevented or slowed by the application of a sealant that protects the leather from further contact with air. For all conservation or preservation procedures, application by a professional is strongly recommended. Locate a book binder or conservation expert near you to find out what they can do and how much it will cost. 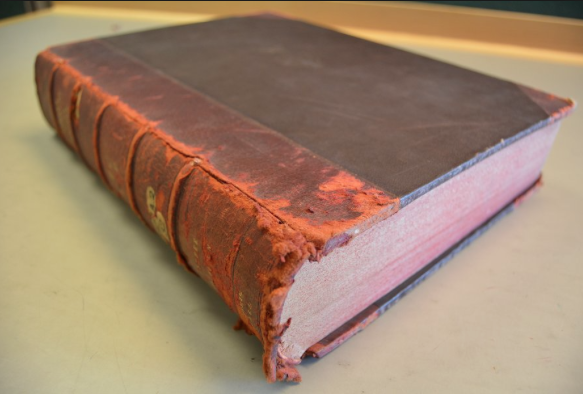 In the meantime, it’s best to keep books affected with Red Rot isolated. Sleeves of polyester, polyethylene and polypropylene are best because they are chemically stable and will therefore not affect the items stored in them. Paper boxes or enclosures work too and should be acid-free and slightly alkaline. There are also many museum and archive associations that will be able to guide or direct you if you have any questions.